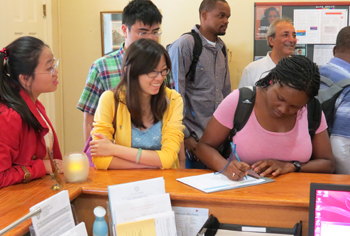 The Slutzker Center for International Services welcomes international students to SU. Students from all over the world have begun to arrive on campus. The Slutzker Center for International Services within the Division of Student Affairs has greeted more than 800 new international graduate students recently. They will continue to do so as the Fall semester nears. In total, more than 120 different countries will be represented on the SU campus, creating an immersive global experience and community on the hill. Pimsiri Aroonsri, an international graduate student from Thailand, who will be studying instructional design, development and evaluation program in the School of Education, has been highly anticipating the opportunity to study in an international academic setting. “It is an honor to study in one of the most prestigious universities. Some of the the reasons why I chose Syracuse University are because of its unique programs of study and the academic environment, which allows for students to develop insights and knowledge in their field and to contribute that knowledge to the university and surrounding community,” says Aroonsri. On Friday, Aug. 16, the Sluztker Center hosted an all-day orientation program for international graduate students that included Ben Ware, dean of the Graduate School; Professor Shiu-Kai Chin in the Department of Electrical Engineering and Computer Science; and many staff within the Division of Student Affairs. Diana Fidaoui, an international graduate student from Lebanon and a teaching assistant in the teaching and leadership program in the School of Education, expressed similar sentiments in relation to the University’s commitment to Scholarship in Action. sharing information about student life, campus culture, health and safety, and much more. Additionally, the students will get to experience the Department of Recreation Services’ ropes course in Flanagan gym, as a way to learn more about each other and themselves, and to build a sense of community in a new and unfamiliar environment. For more information on the international student population at SU, contact Burak at paburak@syr.edu.